Electrodiagnosis is the field of study that, by employing the science of electrophysiology, uses electrical technology to study human neurophysiology. Neurodiagnostics (NDS), electromyography (EMG), and evoked potentials (EPs) are aspects of electrodiagnosis. Information needed to answer any questions regarding nerve injury, muscle injury, muscle disease, localization, and prognosis can be obtained through electrodiagnostic testing. This information should help to focus treatment on the exact site of injury. Various specialists perform electrodiagnostic studies. Understanding and performing electrodiagnostic tests is a requirement in the specialty training of physical medicine and rehabilitation (physiatry) residents and is considered an elective in the training of neurology and anesthesia residents. Every practitioner should be well aware of the normal neurophysiologic function of the nervous system. Electrical signals are generated in the brain, pass through the spinal cord, and travel into the peripheral nervous system. These signals are carried down the nerve to the synaptic cleft, where a chemical release of acetylcholine crosses the synaptic cleft to create an electrical discharge in the muscle. This electrical signal causes the muscle to contract. EMG was the first electrodiagnostic test to be developed. This procedure involves the placement of a needle into various muscles to record different stages of muscle activity, including rest, minimal contraction, and maximal activity. At rest, normal muscle is electrically silent. Damaged muscle tissue may result in spontaneous depolarization of individual muscle fibers. This abnormal activity can be detected during the needle examination portion of the electrodiagnostic examination. Primary nerve injuries that are severe enough to create neurotmetic or axonotmetic lesions, which result in Wallerian degeneration of the nerve, demonstrate fibrillation and positive sharp-wave discharges at rest. Fibrillations and positive sharp waves are pathognomonic for nerve injuries. Primary muscle disorders can also be detected by EMG. With minimal volitional activity, the recruitment patterns of muscle are normal. An individual muscle fiber begins to fire, reaching a threshold of 15-20 Hz, at which point the original fiber recruits a second fiber, which fires up to 15-20 Hz, and so on until there is full recruitment of the muscle. Determination of recruitment patterns is difficult and requires more modern, computerized equipment; however, recruitment patterns provide critical information for determining the degree of injury and prognosis. Furthermore, this information is helpful in identifying individuals who are malingering. A patient may not be fully cooperative in manual muscle testing for weakness. Determination of the recruitment pattern, however, is not dependent on patient cooperation. One problem with electromyographic testing is that needles are used and the study may be painful; however, new computerized technology allows the use of recording needles so small that insertion feels more like a pinch than like the insertion of a needle. Small-gauge needles can be used, because nothing is injected or aspirated. Seek out electromyographers who have access to current technology and who have board certification, in order to ensure that patients do not suffer more discomfort than is necessary during a procedure. Nerve conduction studies (NCSs) are an important part of the complete electrodiagnostic exam. In an NCS, an electrical charge is delivered to a peripheral nerve. That charge is carried down the nerve and generates a muscle contraction. A recording electrode is placed on a muscle innervated by that nerve, and information about the impulse can be recorded, including its latency (the time needed for the impulse to travel from stimulus to recording). The distance traveled and the nerve conduction velocity (NCV) can also be computed. The amplitude of the muscle contraction can be determined and compared to the initial size of the signal, providing information about the number of neurons that are functioning within the nerve. By stimulating the nerve in various places along its course, the practitioner can isolate a specific site of injury. Sensory (first image below) and motor (second image below) nerves may be tested. In a routine carpal tunnel study, for example, conductions of the median nerve above and below the tunnel may be normal, while conduction across the carpal tunnel itself may be impaired. [11, 12, 13] This test isolates the injury to this specific location. Changes in amplitude often signal an axonal injury. Remember that a direct relationship exists between nerve diameter and conduction velocity. Larger myelinated fibers (Ia) are the ones measured in NCSs. The smaller fibers (Ib, II, III) are not recorded with standard nerve conduction techniques. Therefore, a small fiber neuropathy may not be detectable by EMG. A frequent misconception is that electrodiagnostic testing is not useful in an acute injury. Immediately following complete nerve transection, a complete loss of motor unit recruitment is noted distally (neurotmesis). 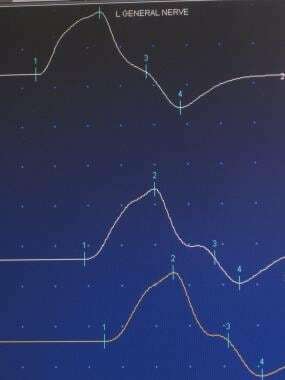 Even with incomplete nerve injuries (neurapraxia and axonotmesis), decreased motor unit action potential recruitment patterns may be seen acutely. Within the first 2-3 days, a decrease in motor amplitudes proximally may be noted. Sensory amplitude reductions are noted toward the end of the first week following injury. Slowing of conduction velocity across the site of injury suggests a demyelinating injury. Membrane instability can be detected by needle examination in 1-4 weeks, with proximal muscles showing up the soonest (due to Wallerian degeneration). At 2-6 months, axonal sprouting occurs, which results in increased motor unit action-potential amplitude and prolonged duration. In a traumatic nerve injury or acute neuropathic process, serial EMG is often performed to assess disease progression or response to treatment, as well as to aid in prognosis. Objectively monitor a patient's progress or deterioration over time. Recording electrodes may be either surface electrodes or small subdermal needles placed anywhere along the neuropathway, including the spine and scalp. SSEP studies are the most widely used EP tests. Stimulation occurs at the extremity, and recordings are made on the scalp, near the sensory cortex. This technique may be used to locate the level of the injury in the nerve root, spinal cord, or brain. In CNS insults, such as spinal cord trauma and stroke, SSEP testing has been helpful in establishing the degree of insult and in determining its prognosis. In addition, SSEPs can be used to determine the level of coma and to evaluate for brain death. SSEPs are also useful for intraoperative monitoring of patients undergoing neurosurgical procedures. In VEP tests,  the practitioner uses a photoelectric, checkerboard-pattern flash to stimulate the optic nerve. This pattern is then recorded on the cortex, arriving at the occiput, near the visual centers. The pattern usually takes 100 milliseconds to arrive and is referred to as the P100. Injuries along the optic nerve, including demyelination, result in a delay of the latency and loss of the amplitude of the signal, similar to the results in NCVs. A P100 at greater than 102 milliseconds is considered beyond the reference range in most laboratories. In cases of multiple sclerosis, for example, abnormalities in the VEP are often the first indicator of the disease process. Optic chiasm tumors also produce recordings suggesting abnormalities. Visual acuity may be determined in infants with suspected visual disturbances. With BSAEPs, the clinician uses an auditory click to stimulate the cochlear nerve. The response is then recorded over the cortex. Because of the multiple signal generators in the brainstem, injuries along this nerve can suggest localization of the lesion to various sites along the nerve route. Five basic waveforms are recorded—for the cochlear nerve, the cochlear nucleus, the superior olivary complex, the midpons, and the upper pons—and interwave times may indicate pathology at a waveform’s anatomic location. BSAEPs may be used to help evaluate for brain death, demyelinating disease, and midbrain tumors. Dermatomal and myotomal EP studies are much more technically difficult to perform and should not be considered routine procedures. Stimulation occurs along the dermatome or myotome, with recordings at the cortex. These tests have demonstrated greater specificity than have SSEPs and are used frequently in clinical research. No discussion of electrodiagnosis would be complete without the consideration of cost. As in most technologic procedures, the cost of the equipment and the necessity for specialty training elevate the cost of performing electrodiagnostic testing. In the 1990s, routine studies cost $700-$1000. Like most other procedures, electrodiagnostic studies have been reduced in cost allowable by health care reform. Medicare allowable rates now limit payments generally to $200-$300, depending on the extensiveness of the study. The real question, however, is whether the information gathered through electrodiagnosis changes the way the patient is treated. Does the test make the treatment more effective? In many practices, there is no question that it does. By localizing the lesion and determining the degree of injury, the clinician can objectively identify the etiology and focus efforts on the actual anatomic problem. What is the neurophysiology of electrodiagnosis? What is the role of electromyography (EMG) testing in electrodiagnosis? How are muscle fiber recruitment patterns determined in electrodiagnosis? What are the disadvantages of EMG testing in electrodiagnosis? What is the role of nerve conduction studies (NCSs) in electrodiagnosis? What is the role electrodiagnostic testing in an acute injury? What is evoked potential (EP) testing in electrodiagnosis? What are the types of evoked potential (EP) tests in electrodiagnosis? What is the role of somatosensory evoked potential (SSEP) studies in electrodiagnosis? What is the role of visual evoked potential (VEP) tests in electrodiagnosis? What is the role of brainstem auditory evoked potential (BSAEP) tests in electrodiagnosis? What is the role of dermatomal and myotomal evoked potentials (EPs) in electrodiagnosis? What is the role of evoked potentials (EPs) during surgery? What is the cost of electrodiagnostic testing? Landau ME, Campbell WW. Clinical features and electrodiagnosis of ulnar neuropathies. Phys Med Rehabil Clin N Am. 2013 Feb. 24(1):49-66. [Medline]. Joyce NC, Carter GT. Electrodiagnosis in persons with amyotrophic lateral sclerosis. PM R. 2013 May. 5(5 Suppl):S89-95. [Medline]. Nguyen BN, Vingrys AJ, McKendrick AM. The effect of duration post-migraine on visual electrophysiology and visual field performance in people with migraine. Cephalalgia. 2013 Aug 22. [Medline]. Kimura J. Electrodiagnosis in Diseases of Nerve and Muscle: Principles and Practice. 2nd ed. Philadelphia, Pa: Davis; 1989. Delagi EF, Perotto A. Anatomic Guide for the Electromyographer: The Limbs. 2nd ed. Springfield, Ill: Thomas; 1980. Gonzales E, Myers SJ, et al, eds. Downey and Darling's Physiological Basis of Rehabilitation Medicine. 3rd ed. Boston, Mass: Butterworth-Heinemann; 2001. Lorin S, Nierman DM. Critical illness neuromuscular abnormalities. Crit Care Clin. 2002 Jul. 18(3):553-68. [Medline]. Gutmann L, Pawar GV. An approach to electrodiagnosis of peripheral neuropathies. Semin Neurol. 2005 Jun. 25(2):160-7. [Medline]. Smorto MP, Basmajian JV. Clinical Electroneurography: An Introduction to Nerve Conduction Tests. 2nd ed. Baltimore, Md: Williams & Wilkins; 1979. Murashima H, Sonoo M, Tsukamoto H, et al. Spread to the dorsal ulnar cutaneous branch: A pitfall during the routine antidromic sensory nerve conduction study of the ulnar nerve. Clin Neurophysiol. 2011 Oct 14. [Medline]. Jarvik JG, Yuen E. Diagnosis of carpal tunnel syndrome: electrodiagnostic and magnetic resonance imaging evaluation. Neurosurg Clin N Am. 2001 Apr. 12(2):241-53. [Medline]. Alanazy MH. Clinical and electrophysiological evaluation of carpal tunnel syndrome: approach and pitfalls. Neurosciences (Riyadh). 2017 Jul. 22 (3):169-80. [Medline]. Li Pi Shan R, Nicolle M, Chan M, et al. Electrodiagnostic Testing and Treatment for Carpal Tunnel Syndrome in Canada. Can J Neurol Sci. 2016 Jan. 43 (1):178-82. [Medline]. Spinner M. Injuries to the Major Branches of Peripheral Nerves of the Forearm. Philadelphia, Pa: WB Saunders; 1978. Goodgold J, Kopell HP, Spielholz NI. The tarsal-tunnel syndrome. Objective diagnostic criteria. N Engl J Med. 1965 Sep 30. 273(14):742-5. [Medline]. Ross MA. Electrodiagnosis of peripheral neuropathy. Neurol Clin. 2012 May. 30(2):529-49. [Medline]. Park JH, Won JC. Patterns of Nerve Conduction Abnormalities in Patients with Type 2 Diabetes Mellitus According to the Clinical Phenotype Determined by the Current Perception Threshold. Diabetes Metab J. 2018 Oct 24. [Medline]. [Full Text]. Omejec G, Podnar S. Proposal for electrodiagnostic evaluation of patients with suspected ulnar neuropathy at the elbow. Clin Neurophysiol. 2016 Apr. 127 (4):1961-7. [Medline]. Zanette G, Lauriola MF, Tamburin S. Electrodiagnosis of Lesions of Median and Ulnar Nerve Hand Sensory Branches: A Case Series. J Clin Neurophysiol. 2016 Oct. 33 (5):454-7. [Medline]. Fowler JR, Byrne K, Pan T, Goitz RJ. False-Positive Rates for Nerve Conduction Studies and Ultrasound in Patients Without Clinical Signs and Symptoms of Carpal Tunnel Syndrome. J Hand Surg Am. 2019 Jan 8. [Medline]. Chiappa KH, ed. Evoked Potentials in Clinical Medicine. 3rd ed. Philadelphia, Pa: Lippincott-Raven; 1997. Pitzalis S, Spinelli D, Vallar G, Di Russo F. Transcutaneous electrical nerve stimulation effects on neglect: a visual-evoked potential study. Front Hum Neurosci. 2013 Aug 19. 7:111. [Medline]. Kim CT, Strommen JA, Johns JS, et al. Neuromuscular rehabilitation and electrodiagnosis. 4. Pediatric issues. Arch Phys Med Rehabil. Mar 2005. 86(3 Suppl 1):S28-32. [Medline]. Devic P, Petiot P, Mauguiere F. Diagnostic utility of somatosensory evoked potentials in chronic polyradiculopathy without electrodiagnostic signs of peripheral demyelination. Muscle Nerve. 2015 Apr 23. [Medline]. 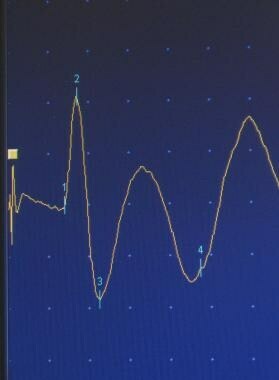 Amantini A, Amadori A, Fossi S. Evoked potentials in the ICU. Eur J Anaesthesiol Suppl. 2008. 42:196-202. [Medline]. [Guideline] MacDonald DB, Dong C, Quatrale R, et al. Recommendations of the International Society of Intraoperative Neurophysiology for intraoperative somatosensory evoked potentials. Clin Neurophysiol. 2019 Jan. 130 (1):161-79. [Medline]. [Full Text]. Holder GE, Gale RP, Acheson JF, et al. Electrodiagnostic assessment in optic nerve disease. Curr Opin Neurol. 2009 Feb. 22(1):3-10. [Medline]. Lieberman JA, Lyon R, Feiner J, et al. The efficacy of motor evoked potentials in fixed sagittal imbalance deformity correction surgery. Spine. Jun 1 2008. 33(13):E414-24. [Medline]. Cheh G, Lenke LG, Padberg AM, et al. Loss of spinal cord monitoring signals in children during thoracic kyphosis correction with spinal osteotomy: why does it occur and what should you do?. Spine. May 1 2008. 33(10):1093-9. [Medline]. Kelleher MO, Tan G, Sarjeant R, et al. Predictive value of intraoperative neurophysiological monitoring during cervical spine surgery: a prospective analysis of 1055 consecutive patients. J Neurosurg Spine. Mar 2008. 8(3):215-21. [Medline]. Kim DH, Zaremski J, Kwon B, et al. Risk factors for false positive transcranial motor evoked potential monitoring alerts during surgical treatment of cervical myelopathy. Spine. 2007 Dec 15. 32(26):3041-6. [Medline]. Rosenberg J. Spinal cord monitoring. Morris PJ, Wood WC, eds. Oxford Textbook of Surgery. 2nd ed. New York, NY: Oxford University Press; 2000. 3133.